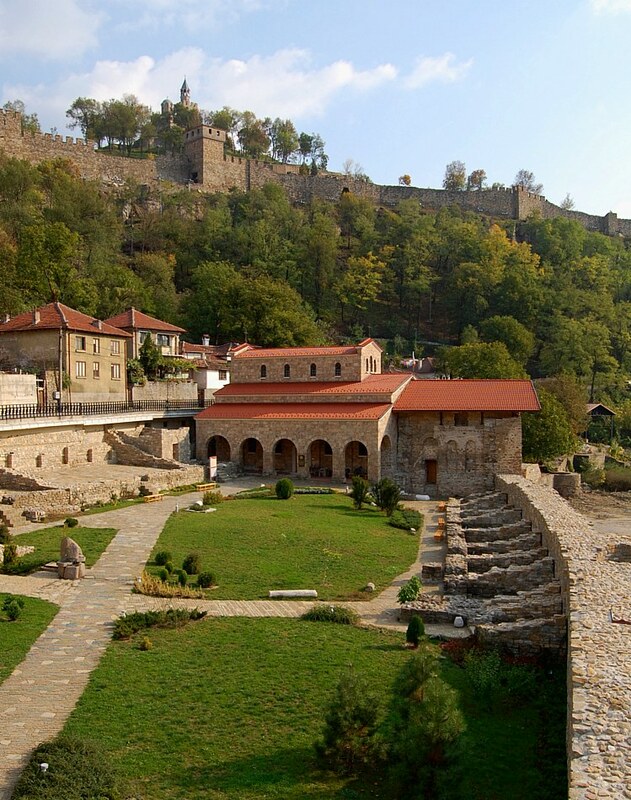 On 22 September Bulgaria celebrates one of the most significant events in recent history. On this date in 1908 the Bulgarian state, one of the oldest in Europe, declared its independence. This is 30 years after the Russo-Turkish War of 1877-78, which ended with the signing of March 3, 1878 San Stefano peace treaty. Thus Bulgaria reappeared on the map of Europe after five centuries of Ottoman rule. 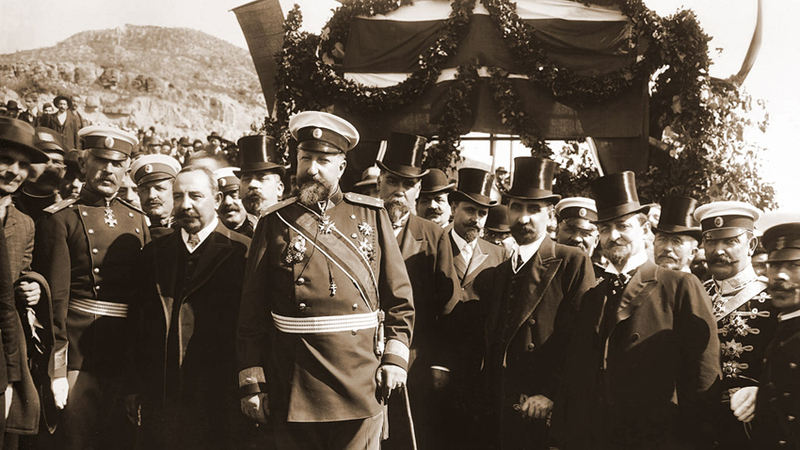 On September 22, 1908 in the Veliko Tarnovo, a manifesto, the Bulgarian King Ferdinand declares Bulgaria's independence. With this act virtually rejected last vassal relations with the Ottoman Empire. Principality of Bulgaria became an independent state headed by Crown King Ferdinand. Porte (Turkey), and then the Great Powers recognized officially Bulgarian independence. The day was declared a public holiday by a decision of the Bulgarian National Assembly on September 10, 1998. Conditions to the Independence of the young Bulgarian state in the early twentieth century were very favorable: in the summer of 1908 Young Turk Revolution in Ottoman Empire ended with success for reformists. Austria-Hungary - one of the great powers imposed Treaty of Berlin, was preparing to annex the two provinces of the empire - Bosnia and Herzegovina - ie To break it. Therefore, the Bulgarian Prince Ferdinand turned directly to Emperor Franz Joseph (meet in Vienna) to coordinate their actions. While Bulgarian authorities seize eastern Railways in Southern Bulgaria, leading to economic contradictions between Bulgaria and Austria-Hungary. Bulgarian government decided to declare independence of Bulgaria to become of September 22, 1908 in the church "St. 40 Martyrs "in the old Bulgarian capital Veliko Tarnovo - a symbolic act during the Second Bulgarian Kingdom. Austro-Hungary announced the annexation of Bosnia and Herzegovina on 20 September. 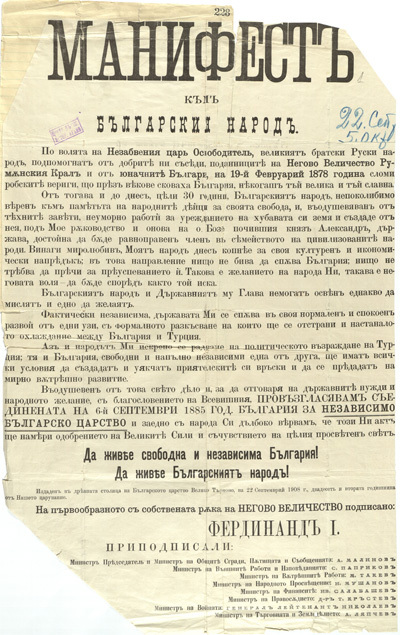 Two days later in Turnovo "St.. 40 Martyrs "Prince Ferdinand reads the Manifesto for independence and celebrate public prayer for the prosperity of the Bulgarian state. Then Prime Minister Alexander Malinov again read the manifesto of the historical Tsarevets hill in front of thousands assembled multitude. The proclamation of independence is not only a great success for Bulgarian diplomacy, but after his vassal principality came to be called Kingdom of Bulgaria and the Bulgarian ruler now titled - king. The difficult situation that occurs in violation of the Treaty of Berlin, e successfully resolved. First was won British Empire, which stipulates - to start negotiations between the Bulgarian Government and the Sublime Porte (Turkey). Negotiations began immediately and the Bulgarian delegation led by Andrei Lyapchev. During them, Porte wants Bulgaria to pay great tribute. As Prime Minister Malinov stated that independence is not redeemed, even leading to partial mobilization of the Bulgarian Army. Russia does not want military conflict in the Balkans and took to mediate in the negotiations. She agrees to simplify the debt of the Ottoman Empire from the Russo-Turkish War of 1877-78, in return for which the Sublime Porte refused to claim compensation from Bulgaria and recognizes its independence. Official so at April 6, 1909 ., then for 10 days European powers recognize Bulgaria for the kingdom and for an independent state.